We’re hard at work on getting two FAR WEST products out the door — the short story anthology, TALES OF THE FAR WEST, which will be available before Christmas, and the Limited Edition version of the FAR WEST ADVENTURE GAME, which will be sent to Kickstarter backers in January. Swordsman 2: Jet Li stars in what I consider to be one of the best films of the early-90s wuxia revival. Nominally a sequel, but with an entirely new cast and a stand-alone story from the first film. New Legend of Shaolin: Take Jet Li, a plot that borrows a bit from the Japanese Shogun Executioner / Lone Wolf and Cub series, over-the-top wuxia badassery and a child wushu prodigy. Yeah, there’s not much to dislike there. Silverado: One of my top 3 favorite Westerns — a tribute to the classic Hollywood westerns written and directed by Lawrence Kasdan, who wrote Empire Strikes Back, Raiders of the Lost Ark, and Return of the Jedi. I consider this film massively under-rated. If you’ve never seen it, remedy that now. Death Rides a Horse: One of the less-well-known Spaghetti Westerns, starring Lee Van Cleef (of The Good The Bad and The Ugly and John Phillip Law, in a revenge plot against a gang of bandits. 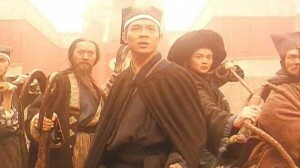 Ashes of Time Redux: Wong Kar Wai’s “art house” wuxia film. Far more stylized and abstract than a straightforward wuxia, the film is more a character-driven drama that also has martial arts. Master of the World: Steampunk airships, Jules Verne, and Vincent Price. You’re welcome. 13 Assassins: Yes, it’s Japanese, not Chinese, and therefore not really part of our genre mix — but director Takashi Miike’s homage to classic chanbara films is just too damned cool to ignore. There are also films that I’ve previously mentioned in earlier Inspirography articles available for streaming — but you’ve already watched those, right? Enjoy. As for me… Back to work!